IN THIS IS LOVE: NOT THAT WE HAVE LOVED GOD, BUT THAT GOD HAS LOVED US. In today's readings, the person of God is clearly defined for us. In each of our readings, we hear an aspect of God's boundless love; all saying the same thing: God isLove! In our first reading (Acts of the Apostles 10:25-26, 34-35, 44-48), we hear about Peter visiting the home of Cornelius, the (Gentile) Centurion. While Peter is speaking, the Holy Spirit descends upon all who are listening. Thus, It is clear to Peter and those with him that "God shows no partiality" and that "whoever fears God and acts uprightly is acceptable to him", Jews and Gentiles alike. When Peter entered, Cornelius met him and, falling at his feet, paid him homage. Peter, however, raised him up, saying, "Get up. I myself am also a human being." Then Peter proceeded to speak and said, "In truth, I see that God shows no partiality. Rather, in every nation whoever fears him and acts uprightly is acceptable to him." In today's Gospel (John 15:9-17), we hear the continuation of Jesus' teaching from last Sunday's Gospel on the vine and the branches. In this segment, Jesus describes what love is and who the Father is (Love). The kicker at the end - "It was not you who chose me, but I who chose you." In our Epistle reading (1 John 4:7-10), St. John describes God as being Love itself. It is not just an attribute of God, it is who God is. There can be no better or clearer description of who God is. It is this Love that sent his only son as "expiation for our sins." 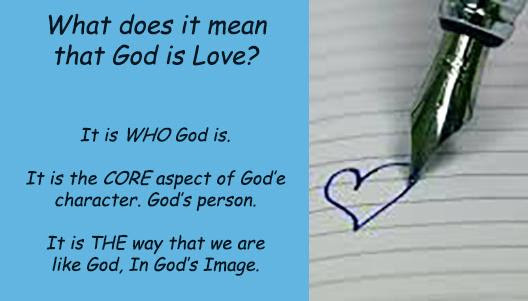 Here is a personal reflection on what it means that God is Love: All the many ways that we refer to God are anthropomorphic in nature, meaning they are human characteristics we assign to God in an effort to understand what is beyond our understanding, except one - Love. Love is not a human characteristic we assign to God, it is God's character that he assigns to us. To love is to be like God; it is how we are in the image of God. For anyone who has ever loved another person so completely as to sacrifice everything for the good of that person, has seen God.